Three of the most respected researchers in hockey shock the world with their findings in On the Origin of Hockey . Hockey was in fact played in England before it was played in Canada. Their proof? Charles Darwin. 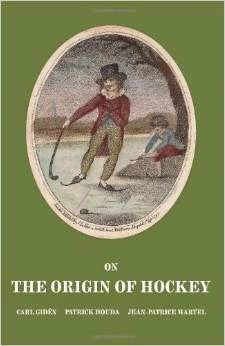 From The Publisher: The debate about the origin of hockey appears to be as old as the debate about the origin of species, though if we compare the number of pages dedicated in every day's newspapers to hockey and those dedicated to animals and plants, the relative importance of each quickly becomes obvious (well, to hockey fans at least). Hockey historians have been looking for the smallest piece of evidence that would reveal the secrets of the origin of hockey. However a wealth of evidence is available - as soon as one starts looking in the right place. This book does not present a new theory based on slivers of evidence. It is a presentation of known facts about the origins of hockey, based on tens of thousands of words, from hundreds of sources, written about hockey played on the ice, with skates, before Montreal's first recorded game. Carl Gidén is a medical doctor who has been researching the origins of hockey for more than two decades. He made news in 2008, together with Patrick Houda, when they announced their discovery of a reference to ice hockey played in 1839 on Chippawa Creek (Niagara Falls, Ontario). Sports journalist Patrick Houda has also been researching the origins of hockey for over two decades and teamed up with Gidén on several projects since the mid-1990s. It was the two of them who, from Sweden, wrote biographies for the main Canadian pioneers of hockey, including the eighteen players who participated in the first recorded game played in Montreal, in 1875. As a member (past president) of the Society for International Hockey Research, Montreal-region-based Jean-Patrice Martel was most impressed by the findings of Gidén and Houda, and always pleaded that they should publish them. The trio finally teamed up to produce this book, with the hopes of reinvigorating the debate on hockey's origins and setting it on sound foundations.